Peppa, 3-room apartment on 1st floor. Spacious, partly renovated in 2012, comfortable and cosy furnishings: open large living room, ceiling height 190 cm with TV, flat screen, radio, CD-player and electric heating. Open kitchen (oven, dishwasher, 3 induction hot plates, raclette grill fondue Set (chinoise)). Upper floor: (open staircase), 1 double bedroom with 1 french bed (1 x 160 cm, length 200 cm). Exit to the balcony. 1 double bedroom with 1 double bed (2 x 90 cm, length 200 cm). Shower/WC. Electric heating. Wooden floors. Small balcony. Balcony furniture. Facilities: children's high chair, baby cot for up to 2 year olds (extra). Internet (WiFi, free). Please note: suitable for families. Non-smoking house. 1 pet/ dog allowed. 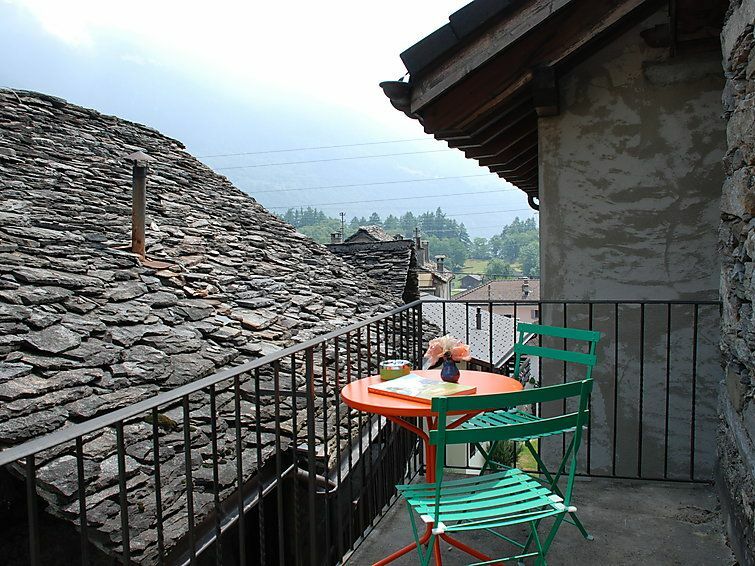 Chironico 10 km from Faido: Small, cosy single-family house Peppa, 2 storeys. In the resort 50 m from the centre of Chironico, in a quiet position. In the house: storage room for bicycles. 100 m long motor access to the house. Public parking 100 m on the road. Grocery 50 m, supermarket 10 km, restaurant 300 m, 2 minute walk to the centre, bus stop 250 m, railway station Faido 10 km. Nearby attractions: Boulder zone, Castelli di Bellinzona (UNESCO), Chiesa di San Nicolao Giornico, Caseificio del Gottardo, Lugano, Locarno. Well-known ski regions can easily be reached: Airolo, Dalpe, Cari, Prato, Valle Bedretto. Well-known lakes can easily be reached: Lago Tremorgio, Lago Ritóm, Lago di Cavagnöö, Lago Retico, Lago Maggiore, Lago di Lugano. Hiking paths: Strada Alta, Val Piora, Valle Bedretto, Prato, Valle di Blenio.